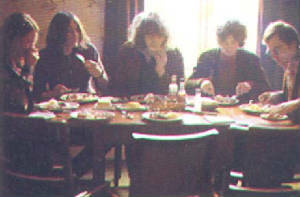 Martin Lamble, drummer with Fairport Convention, was killed when the band’s van crashed on the M1 in the early hours of the morning as they returned from this gig at Mothers club in Birmingham (13th). Ashley Hutchings and Richard Thompson are injured while designer Jeannie Franklin (Thompson’s girlfriend) is also killed. Roadie Harvey Bramham, who had fallen asleep at the wheel, is later prosecuted for “dangerous driving” and serves a prison term.
" 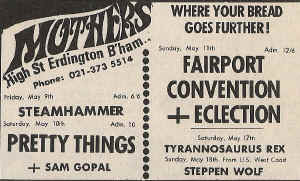 In May 1969 we'd played at Mothers in Birmingham, a nice gig. Sandy had been picked up by Trevor Lucas of Eclection (they were an item) so she wasn't in the van but the rest of us were. Our road manager and sound guy, Harvey Bramham, did most of the driving although I'd do a bit to relieve him. On this particular gig, he'd been feeling peaky all day, quite unwell. Harvey held it together most of the way back, as far as Mill Hill on the M1 motorway. I had a bad migraine so I wasn't in a seat; I was stretched out on the floor with a blanket over my head trying to sleep off this terrible headache. When I woke up, the van was doing things which didn't involve the wheels being in contact with the ground: when it stopped moving, I was the only one left in it. 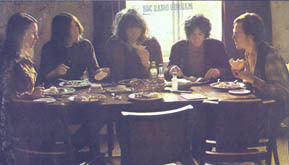 All the gear had gone out of the back and all the people had gone out through the windows and doors. It was about half-three in the morning. We'd gone down an embankment beside near the Scratchwood service area. Everyone was spread out: some moving as they came to; some not moving at all. The emergency services rescued us pretty quickly. Jeannie Franklyn, Richard's girlfriend, was dead by the time the ambulance arrived. At the hospital, they weren't able to bring Martin Lamble back to life. Ashley looked terrible – his face was smashed up and, as with any scalp or face wound, he was covered in blood. Richard had broken his shoulder and Harvey had gone through the windscreen and ended up ninety feet away in a very bad state. I was extremely fortunate in that I had no serious injuries, just bruises and mild concussion. That was a big watershed, I think. In the aftermath, we thought a lot about what to do, whether to call it a day. It had been fun while it lasted but it took a definite effort of will to continue. It had given us a lot but now it had taken away a lot: was it worth it if it was going to cost people their lives? Martin was only 18 or 19 years old. He would have gone on to have been so much more than just another drummer, another musician: there was something very special about him. Even though Sandy had not been present at the accident, she was devastated. When she visited us the day after in hospital they nearly had to admit her too because she was so distressed. I remember she was very upset about Martin for ages. We all felt psychologically traumatised as well as being damaged physically. But by the time Ashley's face was back together and Richard's bones were healing, we'd decided to rebuild the band and carry on. I believe the crash hung over the band in unseen ways. I think it was one of the unspoken reasons for the next big change, when Ashley decided to leave the band later that year after we had recorded Liege & Lief and relaunched the band to some fanfare and acclaim. Whatever the upfront reasons about musical differences and wanting to concentrate on traditional material, I think the accident was the underlying reason why Ashley felt he couldn't continue with us. "